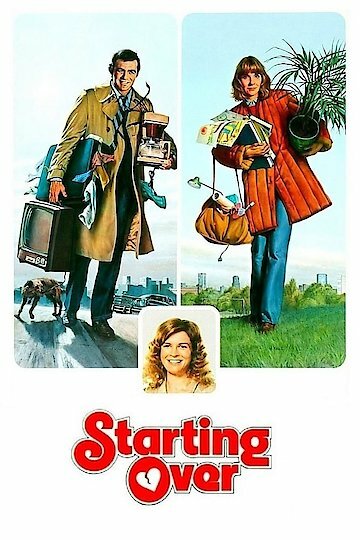 "He wants to straighten out his life.... one way or another"
Starting Over is a comedy that tells the story of a man named Phil Potter (Burt Reynolds) who has divorced his wife, Jessica (Candace Bergen), due to an affair she was having and moves in with his brother and sister-in-law. The brother and sister-in-law set Phil up on a blind date with a nursery school teacher, Marilyn Holmberg (Jill Clayburgh) who is currently working on her master’s degree. He begins his life again from there though the Marilyn, at some point, distances herself from Phil because she feels that it’s too soon after his divorce, though in the long run, Phil discovers how much he has fallen for Marilyn. The movie was nominated for two Academy awards for Best Actress in both Leading Role and Supporting Role (Jill Clayburgh and Candace Bergen). It is a comedy that teaches about the role that romantic love can truly play in one’s life if it is allowed to. It also relates to the fact that sometimes the one you’re married to may not be your true love and about the all-too-common consequences of adultery. Starting Over is currently available to watch and stream, buy on demand at Amazon, iTunes, YouTube VOD online.